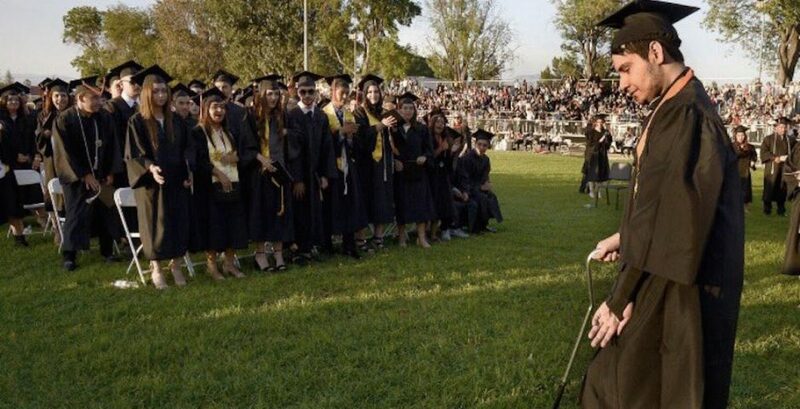 A high school senior received a standing ovation at graduation for walking to get his diploma after being paralyzed for four years. 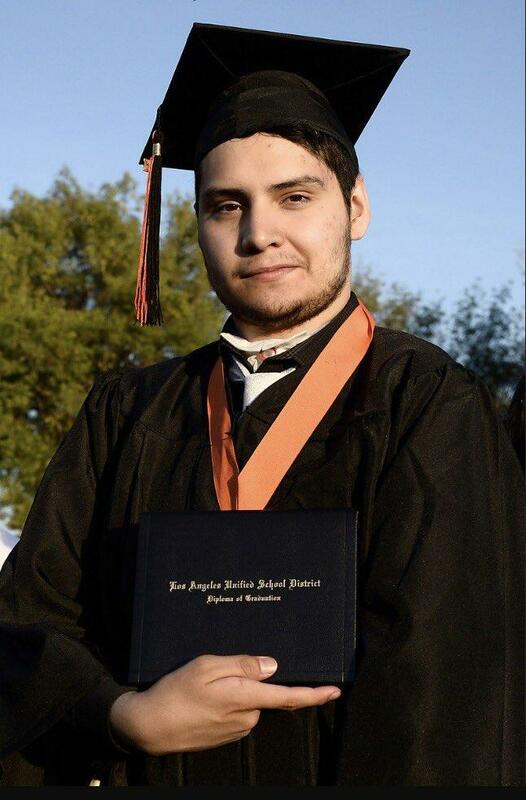 Matthew Garcia, a graduate of Grant High School in Los Angeles was applauded and cheered as he walked at the ceremony – something he never expected to do after becoming suddenly and completely paralyzed in middle school. We spoke to Matthew to hear about how he was able to recover enough to walk again, despite having a rare spinal condition. Tell us the story behind your picture above. When I was in 8th grade, I was playing football with my friends at my middle school. I threw the ball and out of nowhere my back had an immense pain. I went down to the floor. I was rolling around in pain so they took me to the nurse's office. After two hours, I couldn't move my body. They called the paramedics who took me to hospital – I was in the emergency room for eight hours as they tried to figure out what was wrong with me. They took a test where they took some spinal fluid from my back, and when they flipped me over on my stomach they saw my lungs had collapsed. The doctors realized I was really having problems. I was in hospital for weeks as they tried different tests. It's called transverse myelitis – inflammation of the spinal cord. There's still hope for recovery. With my condition, you can either recover nothing at all, or a little bit or you can recover everything. It's different for everyone. It affects your whole body – even your breathing. I have to get connected to a machine at night because sometimes when I sleep I stop breathing. Fast-forward a few years – what happened at your graduation? I was really nervous as we were going there, even before the ceremony. I was freaking out – I didn't want to fall, or trip or anything. 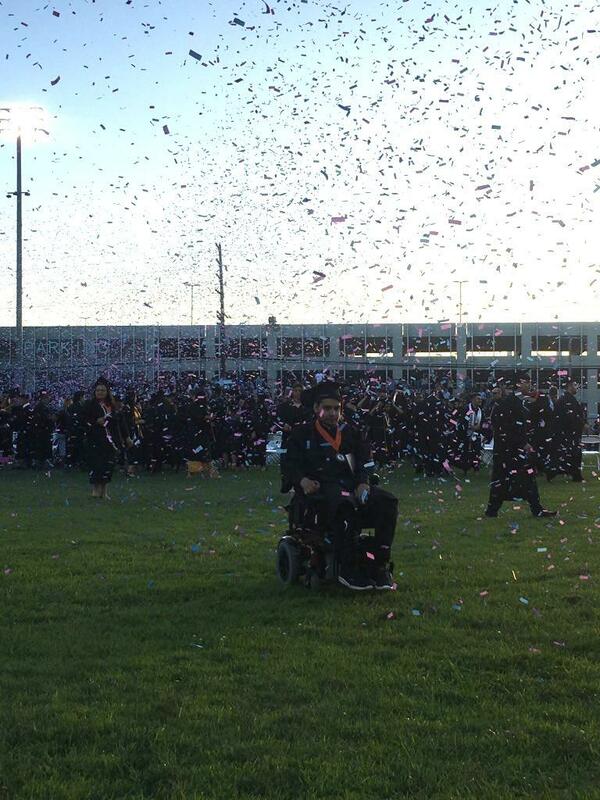 My principal announced on the microphone: "Matthew hasn't been walking but he walks today for graduation." The whole class of 2017 stood up and started clapping as I received my diploma and then walked back to my seat. When that happened, my girlfriend started crying, my mom started crying, my aunt started crying, my dad started crying and my two therapists started crying. It made me feel so happy. I went from being completely paralyzed on January 15th 2013 to now, where I've made a lot of improvement.